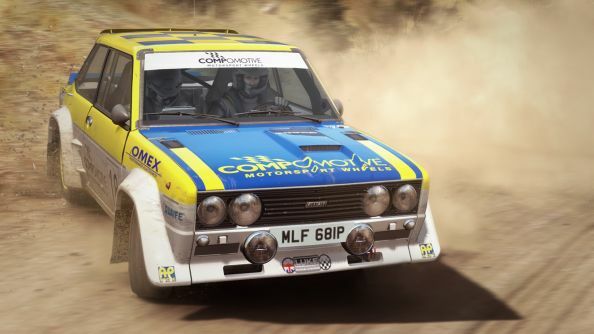 Meet Dirt Rally: Codemaster’s best new game in years. And it’s out today. Why simulation? Because it requires you to focus. I could feel that shift within just a few minutes of playing Dirt Rally. I could feel the room around me fall away as I focused on the sound of my Audi Quattro, driving on the edge of its limits. The windscreen wipers rhythmically squeaking as they cleared snow out of my vision. The mechanical thunks as I changed gears. The choking engine thrum as I climbed the cliff-edge mountain road. This was a real hill climb, passing through weather systems. At the base of the mountain, the tarmac had only a light dusting of snow. The Quattro took the corners with ease. But as I climbed, the snow layer felt thicker, eventually turning to solid ice. My view of the road narrowed, obscured by a blanket of mist and heavy flakes. My only route through was to aim the wheels into the tracks carved by previous drivers. At any touch of unbroken ice, you can feel the wheels scatter, losing control. 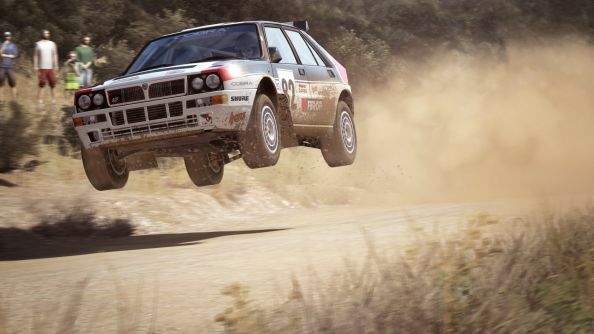 Here’s the trick: Dirt Rally will be available today. While most of Codemasters were working on last year’s Grid Autosport, a small team of developers were experimenting with the studio’s EGO engine. They weren’t interested in making a good looking racer, they were solely focused on the physics engine. What they made was Dirt Rally, a PC-only off road simulator. The difference between the earlier Dirt games and Rally is immediately clear. Instead of gymkhana events and short laps around Battersea power station, my first race was a ten-minute point to point stage along a Greek mountainside in a 1960s Mini Cooper. There were no AI drivers bustling for position, no soundtrack to distract me, and no physics-defying slides. Instead, it was a fraught battle to keep all four wheels on the ground as I sped across the scree. This is a rally game that cares only about you, your car, and your relationship with the road. I drove the front-wheel drive Mini too fast round the first set of corners and I could feel the back wheels swinging out over the side of the cliff, jutting out into thin air. The weight at the rear of the car lifted the wheels at the front, reducing traction and threatening to send me over the side of the mountain backwards. The threat of the fall forced me to slow down, stroking the throttle instead of squeezing the trigger all the way. It took a while for the need for caution to sink in: at the end of my first race my Mini Cooper had been crushed down to about about half its original size, my windscreen was a web of cracks, the front axle was cracked and my gearbox broken. It was in a sorry state. It was then I learned that damage is persistent across stages. Dirt Rally isn’t just about getting a quick time in every stage but maintaining your car, too. Taking risks in the early stages can cost you with damage that will drag down your times in every following race. Thankfully, between stages, you’ve an engineering team who can try and make some patchwork repairs. You tell them which parts of your car to focus on and they do their best to fix it before the starting klaxon. As you progress through the single player campaign you can train up your crew and hire new members, increasing their ability to repair damage. Still, I went into that second stage with only a slightly repaired gearbox. So, you know. Crashing hurts. You don’t want to do it. When I switched from the front-wheel drive Mini to the rear-wheel drive BMW E30 EVO I had to completely relearn the stage I’d just driven. Driving the Mini felt like I was dragging the car round each corner, letting the rear fishtail round after me. In comparison, I couldn’t get the BMW to slide round the hairpins. Whenever I changed up a gear the front wheels would violently kick to the left or right. But, on the straights, I could open up the BMW’s engine and tear along the road. The four-wheel drive Audi Quattro was, again, completely different. Much heavier than the Mini, the Audi was largely unaffected by the loose gravel on the road’s surface, letting it take the sharp turns much more smoothly. The tradeoff came in its much longer braking distance. 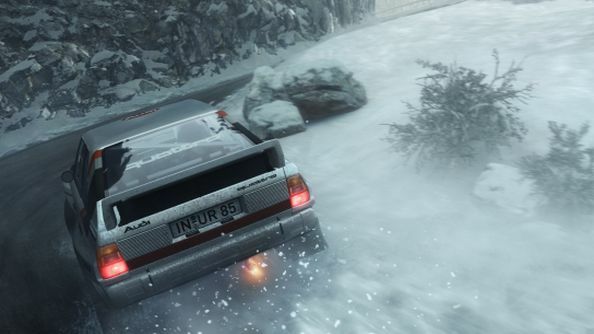 Dirt Rally demands your attention in a way that Dirt 3 and Grid 2 never even attempted. You have to focus wholly on the feedback you can feel from the road if you hope to anticipate each drift and jerk of the wheels. It is draining, stressful, exhausting. But brilliant. 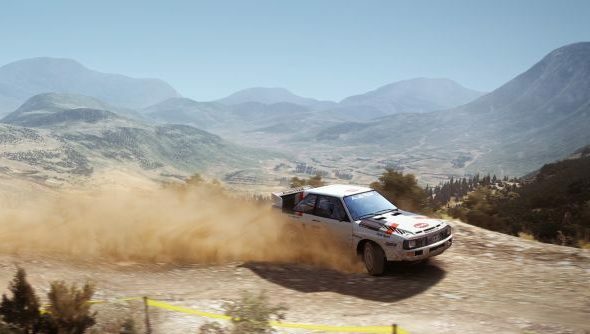 Today, Codemasters are releasing the core of Dirt Rally on Steam and will be steadily adding to it over the coming months. At first it has three locations – Wales, Greece, and Monte Carlo. These are divided into stages, 32 in total. Each stage can be played in a spread of weather types from clear day to thick blizzard and in bright sunlight or pitch black. There’s 18 cars to play with in this first playable release, from the 1960s all the way up to the modern day. Later releases will be more specific. At the end of May the team are releasing Pike’s Peak and specialised high downforce rally cars to race along its high altitude track. The following month they’ll be adding German tracks and a set of Group B rally cars to go with it. Codemasters plan on steadily releasing chunky updates until a full release in November. By that time the remit of Dirt Rally will have expanded to include six-player rallycross and other multiplayer modes. While they’ve a roadmap in place the developer I spoke to was adamant that they’re willing to change that running order depending on what the community most want to see added. And that’s not the only bit of community fostering. Codemasters are planning daily, weekly, and monthly tournaments to foster a competitive scene amongst players. Entrants will set times across a set of stages, carrying across vehicle damage from stage to stage. Rewards are coming, but for now it’s all about bragging rights. Why simulation? Because it’s just the right thing to do. Dirt Rally enters Steam Early Access today. It will launch fully in November.